The 9 Best Cross-Country Skiing Trails in New Mexico! Under your own steam, with arms and legs moving in rhythmic motion you can glide across the pristine and silent beauty of some of New Mexico’s most spec-tacular mountains and forests by just strapping on a pair of cross-country skis. Whether you stride or skate, with poles in hand and a gentle push you can traverse snow-covered landscapes and gently meandering slopes on both groomed trails or backcountry paths you carve yourself. Dress in layers, pack a lunch and take a skiing walkabout in the winter wonderland of enchantment. A great day on the snow is the take-away from New Mexico’s largest full-service cross-country ski area. Whether you like classic or freestyle skiing, you’ll find your mountain high on more than 30 kilometers of 12 to 16-foot-wide groomed trails, from difficult to easy. You can take your dog along too—there are five kilometers of trails just for you and your companion. Pack a lunch and head out on a backcountry trail for a pristine glide through the snow surrounded by spectacular views and vistas of the Carson National Forest. Open seven days-a-week, December through March. You’ll find this resort almost at the Colorado border in the southernmost section of the San Juan Mountains, part of the rugged Rocky Mountain range. There are five kilometers of marked, ungroomed trails that take you into the Edward Sargent Wildlife Management Area, as well as access to a variety of backcountry trails and the perfect powder found there. If you go in January, cheer on the racers at the Chama Chili Ski Classic and Winter Fiesta, an annual event. Check the website for season dates and snow conditions. The quiet hush of your skis sliding across the powdery snow is about all you’ll hear on these 35 miles of trails—groomed or ones you make yourself—as you explore the more than 5,000 acres here. The Valle Grande area is for beginners, but if you’ve got some experience in your legs head out to the South Mountain and History Grove trails. Dogs, on a leash, are welcome on the La Jara K9 Trail, as well as on ungroomed areas with snow. Try a little night skiing while you’re there too! Open Friday through Sunday from late December to early April. At 8,600-feet above sea level, skiing here is indeed a Rocky Mountain high. Views of Wheeler Peak, New Mexico’s highest point, add to the beauty of 30 acres and 22 kilometers of trials, groomed for the classic or skate cross-country skier. A little single track mixed in with a mixture of difficult, intermediate and easy makes this the perfect place for all skill levels. Open Friday through Sunday, 10 a.m. to 4 p.m. from early December to mid-March. Trail maps are located at the trail head, be sure to grab one before heading out. The Nordic ski area is located on the eastern edge of the Jemez Mountains. There are 12 kilometers of trails, all taken care of by the Los Alamos Ski Club. Single track, double track and skating lanes provide options for all interests—easy through intermediate to expert cross-country skiers will all find challenging trails. Views of the Rio Grande Valley and the Sangre de Cristo Mountains infuse this open-air experience with spectacular beauty and snow-covered splendor. Upper meadow skiing provides peaceful solitude. Dogs are allowed only on the Canada Bonita Lower Road, the meadow and out in the backcountry. Open late November to early April. Just 16 miles south of Taos in the Carson National Forest is this winter gem. Given the 8,100-foot elevation, the nine kilometers of trails often have good snow conditions throughout winter. There are eight marked trails covering about 20 miles, diverse enough for beginners and experts. A namesake trail, Amole Loop, is an easy path that takes you across gentle slopes, through flat meadows and quiet ponderosa pine forests. The Upper and Lower Loop follow old logging roads and are more difficult. Ski by the light of the moon for a nocturnal adventure. Be sure to pick up a trail map in Penasco or get one from the forest service website. You’ll find the beginning of a couple of ungroomed trails at the 10K and Ellis Trailheads off Scenic Byway 536, as well as from the Sandia Crest parking lot and Upper Tramway terminal at Sandia Peak. As part of the Cibola National Forest, you’ll slip through forest of pinon juniper and sub-alpine spruce and fir. Stop by the Sandia Ranger Station to check snow conditions and for a map for access to these and other wilderness trails. This 160-acre park has about five miles of trails that, when snow conditions are good, are just right for beginners. Its name means “apple tree” in Spanish, which are long gone, but you will see impressive ponderosa pine and alligator junipers on your ski journey through the forests of this mountain range in the central part of the state. Trails maps are available at the park’s office or website. There’s an entry fee for all visitors. Find your rhythm on this 2.5-mile loop just right for beginners and with enough up-and-down to test the legs of more experienced skiers. Located just below the Ski Basin, the figure-eight layout of this trail has many crossovers so skiers can adapt to skill level but avoiding difficult sections. Snowshoers and dogs not permitted. 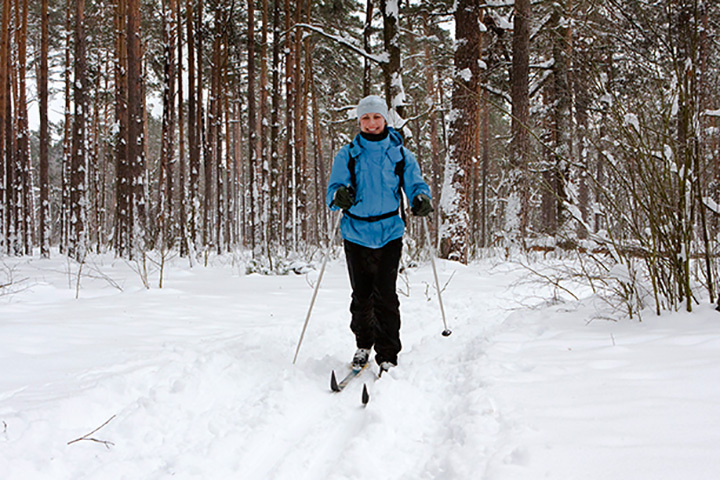 View more New Mexico Cross Country Skiing Trails.